With the 2016 season now over, Brian Cashman held his annual State of the Yankees press conference at Yankee Stadium yesterday afternoon. Some actual news came out of it, though nothing major. You can watch the entire press conference in bits and pieces right here, if you’re interested. As we did with Joe Girardi’s end-of-season press conference the other day, here are the important points from Cashman’s presser as well as some thoughts. Cashman is very candid and at one point he said flatly “our offense was bad.” No sugarcoating it. Now, that said, it doesn’t sound as though the Yankees are planning to jump into anything big in an effort to score more runs going forward. Plan A is to stick with the kids and hope guys like Aaron Judge and Greg Bird and others contribute more next season than they did this season. That seems to be their perfect world scenario. Will the Yankees close the door on signing a big name free agent? Never. It just doesn’t seem like there’s anything that makes sense right now. They could spend a ton of money on a DH like Edwin Encarnacion, and where does that get them? Back to where they were with Alex Rodriguez four years ago, basically. Something might fall into their lap that makes sense, but based on everything Cashman said, if the offense improves next year, it’ll be because the young players come into their own. As with the offense, Cashman doesn’t sound eager to spend huge dollars — there’s no one to spend it on anyway this offseason — or gut his prized farm system to add an impact pitcher. I’d argue Sale is a piece you go get no matter what because he’s so good, so young, and so cheap that he makes any team better. He could help get the Yankees over the hump and into the postseason next year, and still be ace caliber when the kids hit their primes. Cashman mentioned the Justin Wilson trade as “Exhibit A” of how they’ll likely attack the rotation this offseason, meaning trade for youth and depth so they have as many options as possible. Given how hard it is to acquire even decent pitching this year — a team traded two real live prospects for two months of Ivan Nova, remember — acquiring as much cheap depth as possible seems like a smart move. I liked what I saw out of Chad Green and especially Luis Cessa this year. Another one of those deals would be sweet. Cashman did not sound eager to move McCann, though I guess he would try to give off that impression even if he were ready to move him. There’s no sense in tipping your hand. He did talk about the value of McCann’s veteran leadership, how nice it is to have a power-hitting lefty/righty tandem behind the plate, and how there are DH at-bats available. Cashman said he’ll listen on McCann, but he values him highly, and he wants something significant in return. As for Higashioka, adding him to the 40-man roster is a no-brainer. You don’t cut loose a good defensive catcher who hit 20 homers at the upper levels of the minors. At worst, you add him to the 40-man and trade him. Letting him go for nothing is a non-option. I don’t think Higashioka joining the 40-man means McCann or Austin Romine will be traded though. The Yankees could easily send Higashioka to Triple-A and stash him there next season. They don’t have to make a move. I both am and am not surprised the Yankees are not making any coaching changes. I didn’t think they’ve overhaul the staff, but when you miss the postseason three times in four years, someone usually takes the fall. That’s why hitting coach Kevin Long was let go two years ago. Cashman wants to bring everyone back though — I’m not thrilled with keeping Joe Espada as third base coach, but it is what it is — and I’m sure they’ll get a deal worked out with Rothschild soon. As for Girardi, Cashman made it clear that he was speaking about both Girardi and himself when he said “ownership will decide what they want to do as we move forward.” In the past, both have played out their contracts and gone a year as a lame duck. Once their deals expired, they went to the negotiating table. There were no extensions and there was no reason to think this year would be any different. Business as usual. Things could get interesting if the Yankees miss the postseason against next year. That’ll be four October-less years in five seasons. Girardi and/or Cashman might not survive that. Then again, I guess it depends how they miss the postseason. Did they crash and burn because all the kids flopped? Or did the fall a handful of games short while the young players established themselves as bonafide big leaguers? That’ll play a factor in Girardi’s and Cashman’s next contracts. No surprise Cashman isn’t giving up on Severino as a starter. That would be silly. He has the stuff to start, at least when he has a feel for and confidence in his changeup, and he’s so young that you give him a chance to figure things out in that role. I think at worst, Severino showed he can be a really great reliever. He still offers upside as a starter and the Yankees should without question allow him to continue developing in that role. I thought the Cano and Soriano comparions for Frazier were interesting. They were all highly regarded prospects with high-end skills, and Cano and Soriano forced the issue. They were too good to keep down in the minors any longer. Frazier has the potential to do the same this year. The big difference here is position. The Yankees needed a new second baseman when Soriano and later Cano came up. They’re not desperate for outfielders right now. Still, once Frazier is ready, you make room for him. He’s a special talent. My audio was all garbled and I couldn’t get a clean transcription, but Cashman said that while Kaprielian is not on the AzFL roster, the league is aware the Yankees plan to send him as long as he comes through Instructs in one piece. He pitched in a game the other day and by all accounts everything went well. And yes, Cashman actually said OMG. Oh em gee. If I recall correctly, teams can hold players out of the WBC if he finished the previous season injured. Did Tanaka finish the season hurt? Technically, yeah. He missed his last two starts with a forearm injury. But he was never placed on the DL though, and both the GM and manager admitted he would have made his final start had the team not already been eliminated. We’ll see. If Tanaka wants to go and the Yankees can’t stop him, what can you do other than help he doesn’t get hurt? The luxury tax stuff is just the worst. Hate hearing about it. Every time we do it’s a remainder the Yankees are willfully throwing away their market advantage and scaling back payroll at a time every other team is raising payroll. The Yankees seem to have convinced a lot of fans that resetting the tax rate is good and necessary. Is the luxury tax saved enough to make up for the lost postseason and ticket revenue? I hope so. Otherwise this will all have been a giant waste of time. The Yankees and Mets continue the Subway Series a little later this afternoon. Here are some stray links to help you pass the time. Mark Teixeira has been named the Yankees nominee for the 2016 Roberto Clemente Award, MLB announced. Each team nominates one player and the winner is determined by fan voting. Here’s the ballot. The Roberto Clemente Award is given annually to the player who “best exemplifies the game of baseball, sportsmanship, community involvement and the individual’s contribution to his team.” Derek Jeter won it back in 2009. It’s a pretty big deal. The voting ends October 9th. Here’s the ballot again. Go vote for Teixeira. According to the latest Forbes rankings, the Yankees are the third most valuable sports franchise in the world at $3.2 billion. Only the Dallas Cowboys ($4 billion) and Real Madrid ($3.26 billion) are more valuable. Well, technically the Yankees are tied with the New England Patriots at $3.2 billion, but who cares about them. Forbes valued the Yankees at $3.2 billion back in March — the Dodgers are a distant second among MLB teams at $2.4 billion — and they post their updated MLB franchise valuations during Spring Training each year. Earlier this season, righty Chris Martin was higher up on Joe Girardi’s bullpen depth chart than I think most of us realized, but he struggled for a while and eventually wound up on the DL with an elbow injury. The Yankees sent Martin to Triple-A once he got healthy, and, according to Billy Witz, Martin dropped his slider in favor of a curveball while with the RailRiders. Martin hasn’t pitched a whole lot this month, so we haven’t seen the new curveball yet. He told Witz he was better able to control his slider, but the curveball gets more swings and misses, and that’s a trade-off he’s willing to make. I’m not sure Martin will be with the Yankees beyond this year — there’s going to be a big 40-man roster crunch this offseason and Martin’s expendable — but he has a new pitch now, and maybe that will help him stick around the big leagues a few more years. 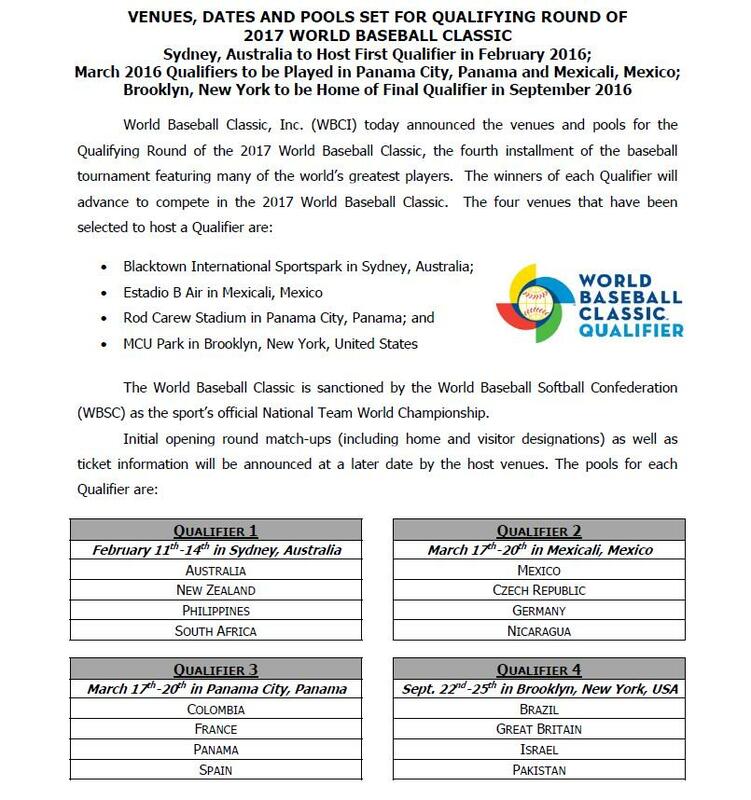 Earlier this week, MLB announced qualifying games for the 2017 World Baseball Classic are coming to Brooklyn. The four-team pool includes Brazil, Great Britain, Israel, and Pakistan, and they’ll play their round robin tournament from September 22nd to 25th next year at MCU Park in Coney Island. The winner of the pool advances to the 2017 WBC. MCU Park is really great. One of my favorites. This isn’t Yankees-related, but baseball in Brooklyn is still cool. Anyway, here is the full WBC qualifying round information. Via George King, Dominican Republic team GM Moises Alou has interest in Yankees bench coach Tony Pena to manage in next spring’s World Baseball Classic. Alou met with Pena at Yankee Stadium yesterday. Brian Cashman said he would grant Pena — who is not under contract for next season anyway — permission to manage in the WBC even though Alou has not yet made any kind of formal request. I know Pena plays a big role in Spring Training, particularly with his brutal catching drills, but there’s no reason not to let him run his home country’s team during the event. As long as the Yankees don’t sent any pitchers to the WBC, it’s cool with me. It came as a surprise, but earlier this week we got word that Jorge Posada plans to play in the WBC. As many commenters noted, the Yankees would probably rather have him in camp working with the new pitchers. That, and he’s coming off pretty major shoulder surgery. Because Posada ended the season on the DL, the Yanks have the right to deny his entry into the tournament. According to Bryan Hoch’s latest, it appears that they’ll do just that. “I am sure he would love to play [in the World Baseball Classic], but he is currently rehabbing from surgery and would not be ready,” Yankees general manager Brian Cashman said. There’s no direct quote, but Hoch says that Jason Zillo confirmed the team’s stance. It’s understandable. The WBC is a luxury. It’s a nice little event we have every few years, and it’s somewhat enjoyable to some fans (yeah, I’m hedging here). What’s more important is Jorge’s ability to play for the Yankees. He signed a huge contract after the 2007 season, and after year one he hasn’t lived up to it. I would think that fulfilling his obligation to the Yankees would be more important to him than a — I don’t want to say meaningless, but — meaningless tournament. Jorge is an integral part of the 2009 club. There’s no sense in risking his health by having him play in the WBC. If he just DHs, maybe, just maybe I can see the argument for allowing him to play. But even then, he’s got to get to know the new guys. And Joba.